On Saturday April 15th, Aaron Albrecht and Stacy Martinez, two masters students in the William & Mary Public Policy program attended the APPAM regional student conference in Washington, D.C. 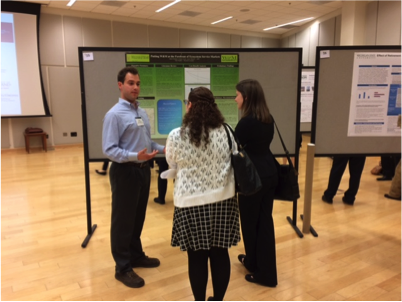 These conferences give students an opportunity to present their work while networking with academics and other students. The evening prior to their presentations, Stacy and Aaron, along with other MPP students who were in DC for a policy dialogue, attended a cocktail mixer hosted by the APPAM conference. This gave students an opportunity to network and mingle with their colleagues from other universities in the region. At the conference both Stacy and Aaron presented their capstone projects which they had completed in the Fall. Stacy’s presentation described her project group’s analysis of a New Hampshire youth development program for low-income girls. 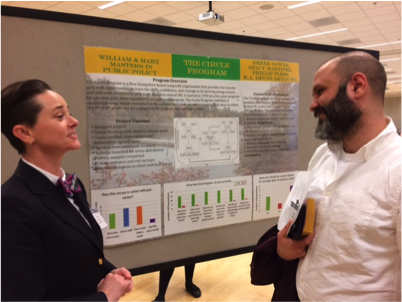 Aaron presented his team’s project which was a study of the potential impacts of implementing conservation credits at the College of William & Mary. When they weren’t presenting their own projects, Stacy and Aaron had opportunities to engage with other students as well as academics. They were able to network and collaborate with peers and view the presentations of students from other universities. There were also opportunities to sit in on roundtable discussions with experts from organizations like the World Bank and RAND Corporation. The final activity of the packed day was attending a panel on advice for interviewing and presenting, two skills which are vital in the professional world.